Sea turtle season is almost here! These beautiful sea creatures can be spotted all across the coast from May 1st until October 31st, where they return year after year to lay their eggs until they’re ready to hatch. Did you know sea turtle nests are protected by the Florida Fish & Wildlife Commission (FFWC)? Unfortunately, the Loggerhead Sea Turtle (most commonly found here) often gets caught in fishing gear, resulting in a tragic ending for these beautiful creatures. In fact, sea turtles are so closely protected by the FFWC that disturbing their nests could result in a fine (or worse). Talk about a damper on your beach vacation! “So, how can I help?” You might be wondering. Here are a few tips to follow to keep our beaches pristine and protect the sea turtles. When visiting the beach, you may be tempted to dig holes or build sandcastles. This is perfectly acceptable and a great way for kids to spend time in the sun. However, be sure to fill any holes and “demolish” the sandcastles before leaving. The turtles can fall into the holes and get stuck, and the sandcastles prevent the turtles from being able to return to the ocean. Keep the beach as flat as it was when you arrived! Mind the signs! Yellow signs can be found all over the beach warning you not to disturb sea turtle nests. The FFWC monitors these diligently so if you see one, that means there’s a nest nearby! Did you know bright lights can disrupt nesting female sea turtles and hatchlings? When buildings have bright lights or you shine a white-light flashlight on the beach at night, it can affect the turtles in a harmful way. Sea turtles orient themselves based on the direction the light is coming from, and if the light is coming from your beachfront vacation home in Destin, the sea turtles will head there instead of back toward the water. Fortunately, “turtle-safe” flashlights are available as well as red flashlight apps on the App Store and Google Play. 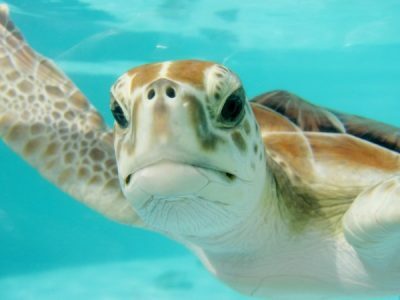 So now you have three tips to follow when it comes to keeping the sea turtles safe! Remember, sea turtle season begins May 1st, so you have plenty of time to prepare. In the meantime, while you are thinking about May, it’s a great time to start planning your summer vacation to Destin, Florida. 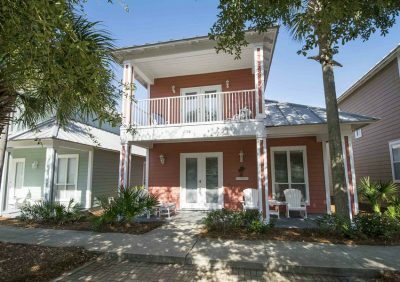 For a vacation home in Destin, we love A Sun of a Beach with our lodging partners Southern Vacation Rentals. Found in the Beach Retreat Cottages neighborhood, up to 10 people can stay here. This inviting home has “summer vacation” written all over it!